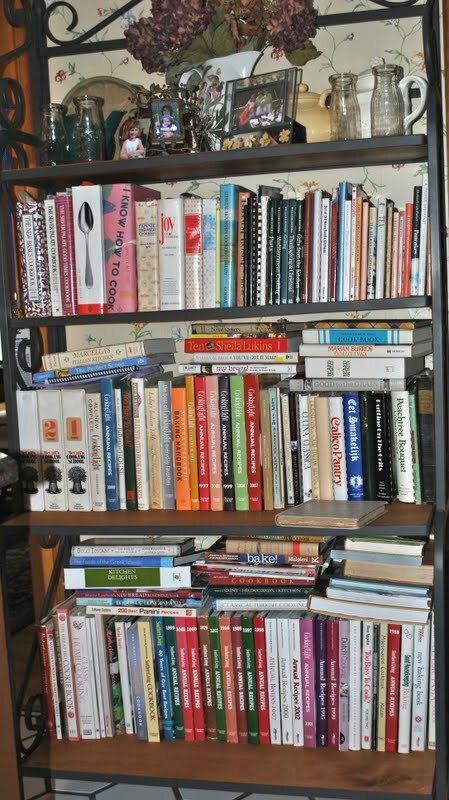 Some of my many cookbooks! 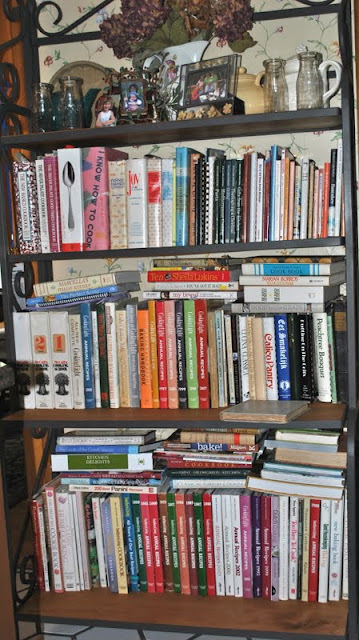 I have been collecting cookbooks for more than 20 years...I have upwards of six hundred. I only know this because my husband and I had a bet on how many I have stashed away on my many bookshelves. So, I was quite surprised when this weeks pick of the 50 Most Influential Women in Food was Patricia Wells. I've seen her recipes in Gourmet Magazine. I've heard her name many times but, I still didn't know much about her. She has written 13 cookbooks and yet, I do not own one of them. How can that be? How did I miss such a contempoary talented cookbook author? A cookbook author who has won the James Beard award several times. She moved to Paris in the 1980's and has lived there, with her husband, ever since. 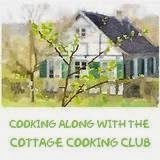 She is a journalist, author, cook and she runs a cooking school "At home with Patricia Wells" in Paris and the Provence. She was the first woman to serve as restaurant critic for the French publication L'Express. She was a writer and editor for the Washington Post and the New York Times. She also served as restaurant critic for the International Herald Tribune. Researching Patricia Wells let me know how much I've been missing so, I will soon own one of Ms. Wells cookbooks. I ordered the Trattoria from Amazon last night. The recipe I chose to represent Patricia Wells is a very simple Chicken Salad with Green Beans. I chose this dish because I have an abundance of green beans growing in my garden right now. It also sounded like something my husband and I would both enjoy. It has been very hot here and this was a wonderfully light dinner. We both had a glass of white wine and a very enjoyable evening! Chicken salad with green beans1. Prepare a large bowl of ice water. 3. In a large bowl, combine the beans, chicken, and celery. Toss to blend. Add just enough dressing to coat the ingriedents lightly and evenly. Add the cilantro and toss again. Taste for seasoning. At serving time, season with pepper. Tahini-lemon-yogurt dressingIn the food processor or blender, mince the garlic. Add the tahini, yogurt, lemon juice, and salt and puree to blend. Taste for seasoning. The dressing can be used immediately. (Store the dressing in the refrigerator for up to 1 week. Shake to blend again before using). Oh - that looks so good! I have a couple of her books & just love them. This certainly would make a light summer meal. Kathy, I didn't have any of her books, either. And to make matters worse, I couldn't even find one at the Barnes and Noble near me. This woman is seriously under appreciated! This chicken salad is my favorite kind of dish. If I'm going to eat meat, I want it to be mixed with lots of veggies. The dressing looks great, too. How healthy and delicious does this look?? I've never heard of beans in chicken salad, so I'm excited to try it. 600 cookbooks? I'm not sure I could fit that many in my apartment! Your salad looks delightful, and I'm glad you could use those beautiful, fresh green beans! Hi Kathy! Gosh, I'm so glad that you commented on The Spice Garden, as I'd visited your blog earlier to see a Patricia Wells post and I missed it! I have A LOT of cookbooks, but not as many as you, Kathy. :) That is quite a collection. Mine is growing and now my husband has to put up a couple more shelves for me in the family room. I have also heard so much about Patricia Wells and she is often on Martha Stewart's show and so I have enjoyed watching her cook. 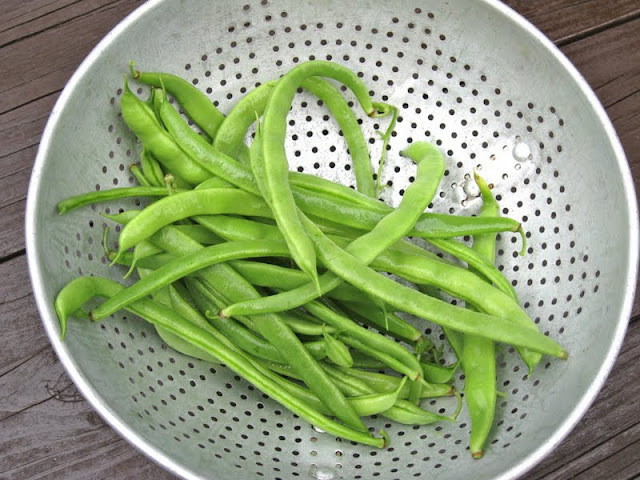 How great that you were able to use fresh green beans from your garden to make her salad recipe. It looks like the perfect meal for a summer lunch or dinner. This looks delicious and I just added it to the menu for this week's lunch line up. Thanks for posting. I do have one cookbook by Patricia Wells and I love it, may have to take a look at some of her others.